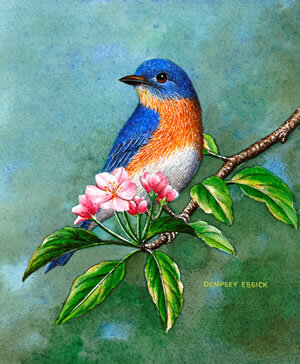 I want to dedicate this painting to our daddy bluebird who has shown to be an exemplary father. We had the same pair of blues for years (when you feed them daily they get to know you and you get to know them personally) and we were saddened to come home and find mama bird dead in the road. It was during nesting time and the babies had hatched. All alone, that daddy bird worked continuously to keep those four babies fed until they finally fledged. It was only after the kids left home and he taught them to feed did he go looking for a wife. The first female he brought did not like our box and it was the second female who approved, stayed, and continued the family. We were privy to this and were honored to be included in the restructuring of the family.